This week was pretty productive with my Diamond Chains quiltalong. I have all of my diamond blocks made (28). I haven't decided 100% to go with the purple fabric yet, but right now that's what I'm using. You can still join at Tilda's Twisted Life. I worked on my Crumb Along at Jo's Country Junction. I have 24 blocks that make me happy and removed the yellows and others that I did not like. I will not be putting the same constant fabric with the blue background and the pink roses/buds in every block. It's just too much. A bomb went off on my desk! I will be joining the DUO quiltalong next week. It's not a lot of blocks and I will probably be doing a table runner project. The point is that two gals from across the pond of each other are focusing on the quilting. One hand-quilts and the other FMQs. Hopefully I'll get some great quilting tips. Here's my cut up rows 5 and 6 of the Victoriana Designs Fabric Party. Normally you get one row to do per month. 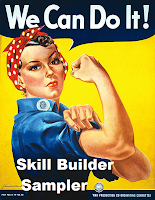 I'm caught up on my We Can Do It Skill Builder Sampler. YEAH! I also sorted some stuff that I had in the 80's. These fabrics have been put away forever. I found them today when I was looking for a juicer. What a find! Soooooooooo happy! An over a foot pile of fabric, quilting patterns for quilts and baby quilts. Gardening books, notions, and extra bins. Whee! If you're in to scraps like I am right now, win an autographed copy of Patchwork-Play Quilts at http://roguequilter.blogspot.com/2011/09/new-book-giveaway-woohoo.html The patterns in the book are right up my alley and just so fun! Melinda is also having a giveaway where you could win My Memories digital software. Hurry, the giveaway ends on 9/27! You can sign up at http://tildastwistedlife.blogspot.com/2011/09/my-memories-software-giveaway.html Good luck! Here's block #11 - Beacon Light for the We Can Do It Skill Builder Sampler. In this block we "made our own fabric" from scraps. For a great giveaway go to http://pnksweethrt.blogspot.com/2011/09/my-memories-giveaway.html?showComment=1316350769016#c5686809172204923675 You could win a MyMemories digital scrapbook software. Also like MyMemories on facebook! The Crumb Along at Jo's Country Junction http://www.joscountryjunction.com/?p=4874 is a color challenge for me. I really like doing the blocks. I really liked Jo's suggestion for the flying geese block. I need to do more of those! Here are my 25 blocks that I made this past week. Some of them will not be making it into the quilt. There are just too many colors right now. I bought one fabric (4 yds for $8 that was supposed to be for a quilt for my mom but the fabric didn't match what I had). The rest of this quilt is made up of scraps and orphan blocks and left over half square triangles that I just can't seem to throw away from other projects that have you cut a corner of flying geese. I'll need to keep spying on my flickr group with this QA and get some ideas. It's at our Flickr Group . I don't like the blocks with black, yellow red, or navy blue in them. Grrrr. Maybe in the grand scheme of things they won't be that bad. Each block is 6" finished (6.5"). I really like the blocks with the flying geese, circles, pinwheels, and half square triangles in them. Here's two blocks that I really like. I may try to stay in these two color families. With the Blue Patch Mystery quiltalong getting closer to the end I will have a lot of the light blues. I am also close to finishing the Rockin' Robin quiltalong and I would have all those pinks. Hmmmm. Sounds like a plan! I also finished my nine blocks for The Block Lotto this week. September's theme was a curved rail block in batiks. I was afraid of the curve and wasn't going to enter. But I did them and they turned out great! Blondie wanted a block in red, yellow, and white. The scrappier the better. She also liked stars. I am very happy with this block. I'm still thinking about my layout for the Diamond Chains QA. I LOVE the block idea that Melinda had. I'm a little worried about negative space quilting. I'm going to stalk the Flickr page on that quilt along as well. Stop by and see who else has what else going on with Lee at Freshly Pieced! The We Can Do It Skill Builder Sampler for Block 10 is the Ohio Star. I am very happy with the quality of my work on this block. I attribute this to participating in the different quiltalongs and samplers that I have been doing this summer. I'm not 100% thrilled with my color choices, but the floral star points are just a little sentimental as it was left over fabric from a dress that my mom made for my sister in the 70's. I wanted to make sure I used it a couple of places in this quilt since the colors are in the same color families. I should have put something that popped in the middle, but I haven't put a light center anywhere for a while and wanted to use it. Yeah! Count another quiltalong project off of my list for the week! Jo's Country Junction is having a "Crumb Along". If you are not familiar with crumbing, check out Bonnie Hunter's Quiltville blog, Quiltville You can check out her site and see lots of awesome free quilt patterns including a pattern for Crumbs. You can join the Crumb Along with Jo. It hasn't officially started yet. If you haven’t heard about it, here’s the link. You can also click the button on my sidebar to get there. I bought the flue fabric on the left with the pink rose dots on it a little while back to add to some fabric that my mom had started in the 80's. It didn't match like I thought it would match. I think it will work for my Crumb Along. I am going to try to put this fabric in every crumb block. I am figuring to make my blocks 6.5" (6" finished). I hope I can make my orphan blocks work with some of this. This picture shows the fabric sitting on top of all the scraps in my very very full scrap drawer. I haven't set a goal yet of how many blocks I will need to make per week to keep up with the Crumb Along. Hopefully Jo's instructions will help me sort that out a little better. I'm shooting for a queen-sized quilt if all goes well. Jo also has set up a a flickr group listed as Crumb a Long Quilts. Check it out! As for my Block Swap Adventure Block, here's a sneak peek of the September block for Blondie in North Carolina. It is being mailed from Ohio on Monday. I'm very excited about this block. I may have to do this one again for myself and one of my samplers. It's called Morning Star 2 from Quilter's Cashe. Hope you like it too, Blondie! Here's block 9 for the We Can Do It Skill Builder Sampler. Lovely block received here from my Block Swap Adventure partner, Blondie. Sorry for the gloomy photo. Ohio rain is upon us. Fall is coming very very quickly. But who couldn't be cheery with this beautiful block? It fits my color scheme perfectly. The oranges are much prettier in person, and the bacground is a little more yellow than this. LOVE the arrows too! Great job, Blondie! Thank you. I was playing around with some garage sale finds blues and was going to make another LaZboy chair cover. Well, I got this far and thought this would be a better baby quilt instead of a chair cover. What am I going to do with another baby quilt you ask? This is such a great event - between September 15th and October 15th, you make and donate, in your area, quilts for children. Your choice of charity, your choice of quilt - and such a great cause! This is the second year for this event, sponsored by the DC Modern Quilt Guild and Kate of Swim, Bike, Quilt. Check it out! Prizes too! I have had a jelly roll for a very special person that is getting married. I have been waiting for the right pattern. This looks like this will be it! If it's worth a special post on my blog it is definitely worth checking it out! Judith is hosting rather a nice giveaway.... Check it out and good luck! But when I do that it kinda looks like this and just doesn't look right. (Don't mind the paisley color in the bottom right, that's the quilt on the bed now.) I am also down to less than two yards of the dyed green, but I am willing to try to dye more. I also didn't pay attention to how the white bars on the blocks should go. I made all of them exactly the same. I could either make more or rip some of these out to turn them to make corners. I am down to less than two yards left of the dyed green fabric (I dyed SEVEN yards!!!) I lost some to experimental blocks to other colors, but not that much. I am willing to try to dye more. I think it will match because I like the little variations here and there. I think the spaces are too big and I'm not sure what color to use yet... It will work itself out. I still just LOVE the block! Click on "Vote now Jelly Roll Quilts" This is the baby shower quilt I gave to a co-worker that had her baby girl this week.